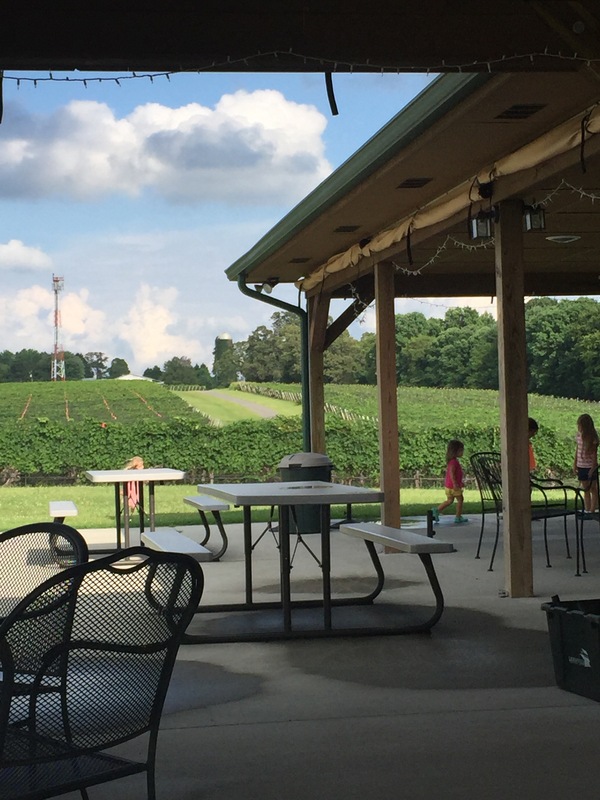 Scrolling through on a Saturday morning, I caught a glimpse of the wine smoothie at Sweet Home Carolina Vineyard. After looking up the location, we saw it was convenient to the drive we had in store the next day just off of Highway 421 back to Raleigh. Upon arriving, we noticed a quaint little building, right off of old 421 Highway. It was a hot afternoon, so we were looking forward to the refreshing wine smoothie that awaited us. The tasting room itself is beautiful. On your left, there’s a large wall of stonework profiling a fireplace with small shelving built in for candles. The crimson red walls provide a nice ambiance for tasting. There was also a large grand piano in the room, which adds to the experience I’m sure at times as I’ve seen one of the owners playing it in other pictures (we didn’t get to hear it this day). Stepping up the bar, we decided to try a wine smoothie first and then a small tasting. We enjoyed the smoothie on their back deck, which felt great with the fans and breeze blowing through there. The view was serene and peaceful looking out at the vines themselves with a slight view of the very top of Pilot Mountain in the distance. After finishing our smoothie, we made our way back in for a small tasting. We tried 6 of their wines. One red, three white and two fruit wines. Normally we go more for the reds and a chardonnay, but their specialties seemed to be in their fruit wines. Additionally, we learned that all their fruit wines are 100% fruit. We also enjoyed the labels with the tiny horses, which are normally raised on the property (also weren’t there the day we visited). All were delicious, but we left with a bottle of the Peaches & Dreams, as my wife wants to attempt a Peach sangria. Lover of North Carolina Wine? Then your TV thirst will finally be quenched. A new show profiling NC Wine will debut on UNC TV Sunday, October 2nd at 1:30pm. The Salisbury Post reports that the premise will have Lisa Prince visit two vineyards or wineries to help you see the beauty that is exists in locales all across our state. Henk Schuitemaker will also join her to give a commentary on the wines discussed at the end of the show. 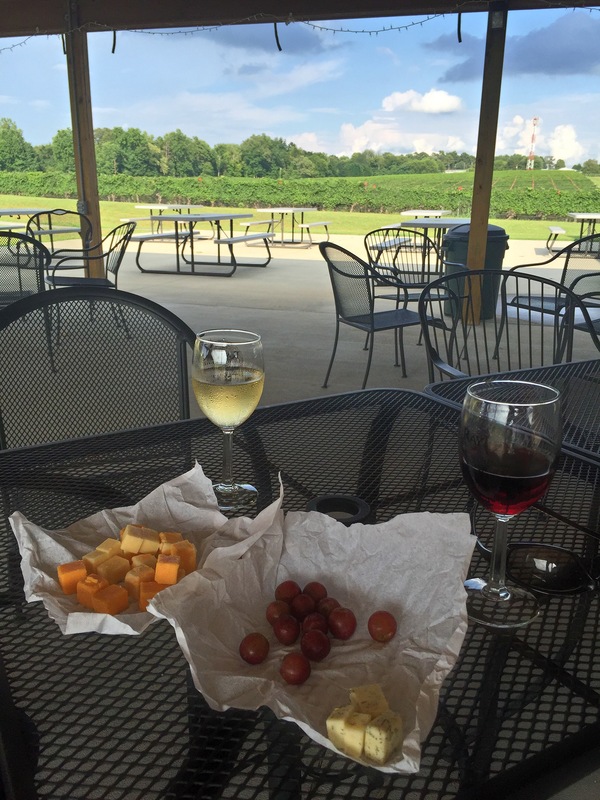 Having just made a trip to a few southern California vineyards, us North Carolinians have it pretty good with the experiences you get in many of our low-key tasting rooms across the state. Glad there will be a TV show to demonstrate this to the entire state now. In the first episode, Lisa will visit Childress Vineyards in Lexington, NC and the Mothervine in Manteo, NC. To see the full schedule, head over to the The Salisbury Post. 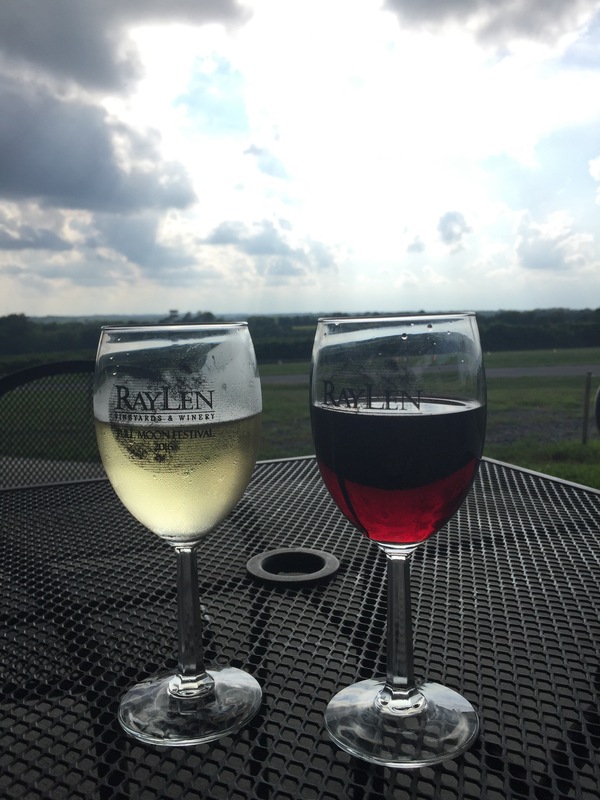 We’d heard so many good things about Raylen, we couldn’t wait to stop by. It’s an easy stop for us as it’s on the way from Raleigh to Hickory – a trip we make a few times a year.